Allcry Ransomware is one more file-encrypting application that should never be active on your personal computer. If, unfortunately, it is already up and running on your personal computer, do not waste any time and conduct its complete removal. If you are not familiar with ransomware programs, you must know that they are created for a single purpose – to lock your data without any notification. Developers of such malicious applications use them to make illegal profits from unsuspecting users by demanding a ransom in return for decryption services. To have a better understanding of how the ransomware program in question works, be sure to read the rest of this article. In addition to such information, we also provide a few simple, yet effective, virtual security tips that will allow you to maintain a fully secure operating system at all times. Below you will also find a detailed removal guide that will allow you to delete Allcry Ransomware in just a few simple steps. Once Allcry Ransomware enters your operating system, it immediately starts doing its dirty works. The overall functionality of this malicious program is rather simple. Our researchers are well acquainted with most inner workings of this malware since it functions a lot like other currently active ransomware applications. Just like its counterparts, the malware in question first determines the contents of the affected hard drive. After doing that it initiates the encryption procedure. Unfortunately, due to silent nature of this process, most Internet users are blindsided by this devious program. 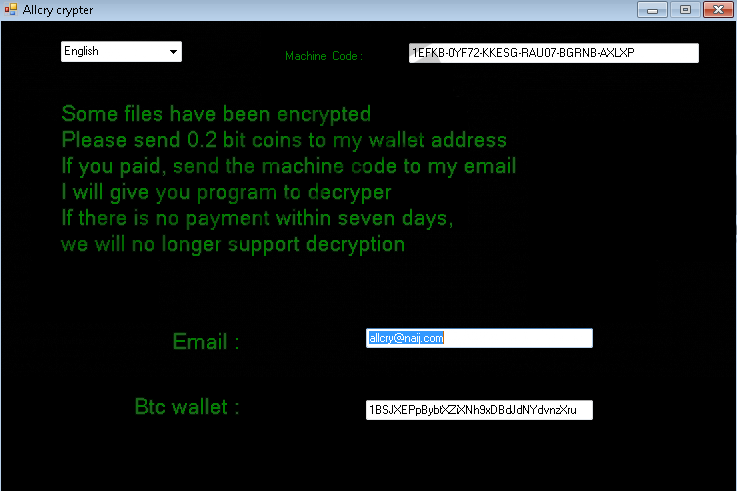 Very few users, if any at all, can stop this ransomware before it has done any harm. Fortunately, it does not affect files that are critical for your operating system’s functionality. However, other important data could be locked by this malicious application with a powerful cipher, which means that manual decryption is out of the question. Right after the encryption procedure is over, you will see a window with a ransom note, which tells you that you no longer have access to your data, and if you wish to regain it, you must pay 0.2 Bitcoin in return. We highly advise you not to do so because malware developers are not legally bound to decrypt your files even if you abide by their demands. It should be more than obvious why the complete removal of Allcry Ransomware is crucial. Make sure to delete it with the help of our detailed removal guide that we present below. It is important to note that Allcry Ransomware is mostly targeted at users located in South Korea and China. While this is the case now, it is important to highlight the fact it could still affect users from around the globe. Thus, it is critical to have a secure operating system at all times. To improve your overall virtual security, you need to take preventative steps. First and foremost, make sure to install a professional antimalware tool if you do not have one already. Such a tool is imperative because it can detect and delete any suspicious or malicious program in an automated manner. Furthermore, we recommend practicing safe browsing habits to lower the risk of encountering devious applications. We urge users to avoid from all questionable third-party download sites because they are notorious for being the primary source of bundled installers. Malware developers often use such setup files to spread their invasive programs. Likewise, we urge you to stay away from all email attachments that are sent to you by questionable third-parties. It is important to do so because cyber crooks are known to use spam email campaigns for distribution purposes. These seemingly simple precautionary steps will allow you to maintain a fully secure PC at all times. Follow the instructions that we present below, and you will be able to delete Allcry Ransomware in just a few simple steps. It is critical to terminate every single bit of this devious program to stop its malicious functionality. If some traces of Allcry Ransomware remain active on your personal computer, the malware in question might continue to function. In other situations, Allcry Ransomware could be silently restored with the help of just a few of its traces. To be sure that the removal has been successful, you need to double-check your operating system for anything associated with Allcry Ransomware once you are done with the manual removal. Alternatively, you can scan your PC with a reliable antimalware tool for any leftovers of Allcry Ransomware. Select the malicious .exe file and then tap Delete on your keyboard. Note that the name of this file is random. Type regedit into the search field and then select it. Select a malicious registry key named Allcry Software and tap Delete on your keyboard. Quick & tested solution for Allcry Ransomware removal.